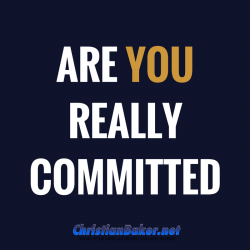 Are you really committed to achieving the life you want? If you really want to achieve something, you first have to make the decision to do it. Coming up I’ll share with you the power of making a decision and how important it is to Your success and achievement! Everything we do first starts off with a decision we make in our own mind. So, if there something in your life you’re not happy with, something you’d like to change or improve. You need to make a decision to change it! So many people want to change, stop, or improve something in there life, but fail because they haven’t fully made the decision and the commitment to do it and actually make it happen! Otherwise it will just remain a vague desire and you’re just leaving it to chance. Or, if you attempt to try to make a chance, or achieve something, the mind doesn’t understand or process the word try, you either do or don’t do it, there’s not inbetween. When you make a decion, you find a way to make it happen. You can either leave it to chance and hope you will get round to it one day, or you can make the decision to make today day one of committing to achieving the life you want. You need to decide and get clarity on what you’re going to achieve, commit to it, take action and make it happen! What’s the best decion you can make right now that your future self will thank you for? Decide what you want to do, Commit to it and Just Do it! Go on you You Can Do IT!